In Sacramento, schools are looking to Safe Routes to School programs as a way to address one of the biggest barriers to student achievement – chronic absenteeism. Chronic absenteeism - when students miss 10% or more of the school year - has significant impacts on students, schools, and the community as a whole. Students who are chronically absent are more likely to drop out of school due to compromised learning, leading to higher likelihoods of unemployment, incarceration, negative health outcomes, and broader societal costs. 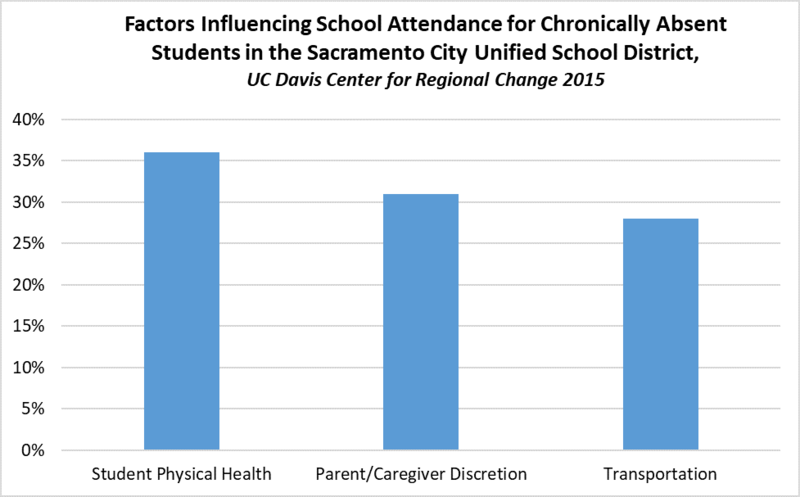 According to a 2015 study by the UC Davis Center for Regional Change, the top barriers to student attendance in Sacramento City Unified School District were physical health, parent and caregiver discretion, and transportation. Within these categories, specific barriers included missing school for doctor’s appointments, chronic health conditions, adults not being able to provide help getting to school, and home responsibilities such as taking care of younger siblings or sick family members. When asked what would make it easier for students to come to school, transportation assistance was ranked the highest, followed by assistance with time management and health. The goal of Safe Routes to School is to improve and promote transportation options, making it a perfect opportunity to provide students with the support they need to safely, affordably, and reliably get to school on time. Further, students who are more physically active, tend to miss fewer days of school due to poor health. 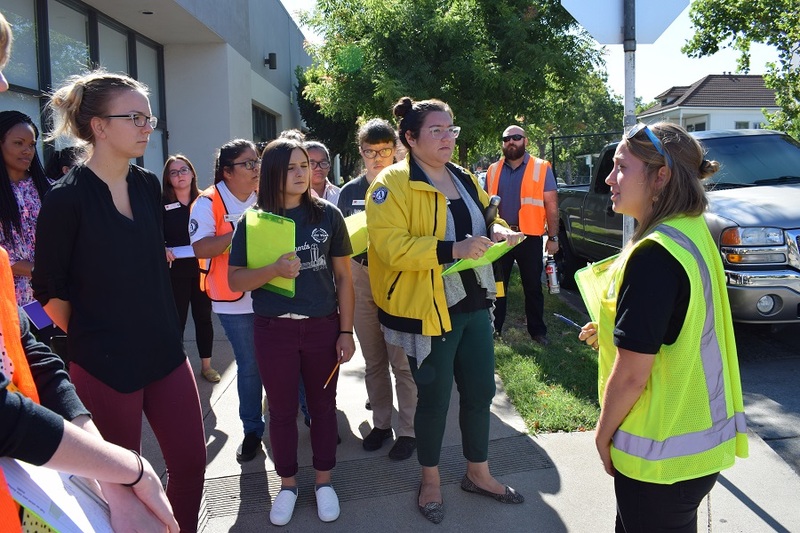 The Sacramento City Unified School District, in partnership with AmeriCorps program, City Year, are tackling chronic absenteeism and are interested in better understanding how Safe Routes to School Walking School Bus programs can be incorporated into their initiative. 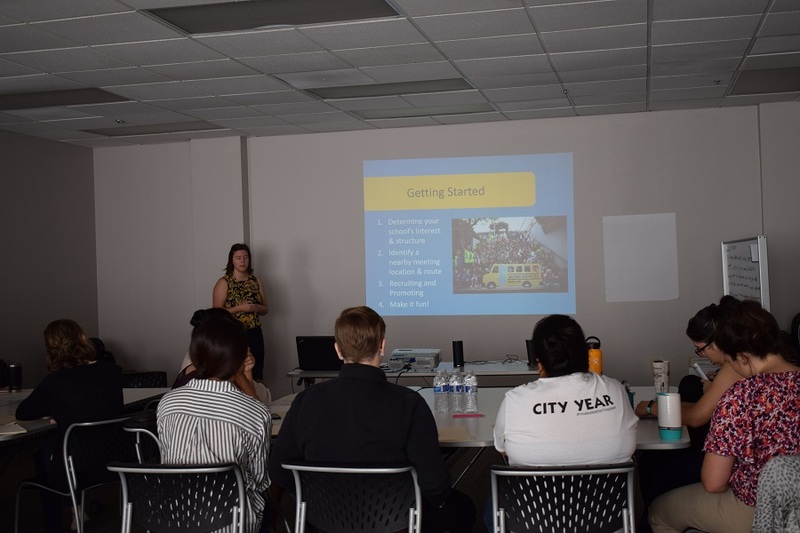 On Tuesday, July 24th WALKSacramento led a training with City Year staff on ways to start a walking school bus program in coordination with schools. A walking school bus is a very simple concept, a group of students and adult leaders who walk to school together. In practice, these programs have the potential to help reduce chronic absenteeism by providing families with a reliable, safe, affordable, and convenient option for getting to school. Over the years, the main factors we’ve heard from parents affecting their decision to not let their child walk or bike to school include unsafe traffic conditions, neighborhood violence or crime, time constraints due to work or home schedules, lack of an older family member who could walk with the student, and living too far away. Walking school buses can help alleviate many of these barriers by creating safety in numbers and allowing busy parents to have peace of mind knowing that their child is walking to school with trusted adults. Walking schools buses also save parents time, by enabling remote drop offs that avoid busy and often slow school drop off zones. The walking school bus training provided City Year team leaders with new ideas and tools to positively impact attendance, health, and community involvement through walking school bus programs over the course of the upcoming school year. Their support will help build upon our goal of community-supported Safe Routes to School programs at eight schools in the Sacramento City Unified School District and also expand Walking School Bus programs to other schools in the District. 27% of chronically absent Sacramento City Unified School District students and families reported a lack of quality transportation as a causal factor. City Year practiced assessing a route to determine if it would be suitable for a walking school bus.